Due to the extreme number of Encrusted Objects that have been found this summer I thought it might be interesting to take a little bit closer look at the conservation process for these items. 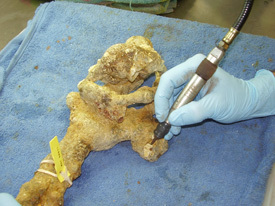 When an Encrusted Object is found the archaeological process begins. As with any other artifact found on the wreck sites the boat captain will number, tag and record each item and the coordinates of where it was found. Upon returning to shore the artifacts are brought back to the conservation lab and are checked in by John Corcoran, our Senior Conservator and the boat Captain one by one. They are then placed in wet storage to avoid interaction with the air, which would harm the artifact until we have a chance to work on them. The artifacts are first photographed and all associated site data is logged into our database along with measurements, and weights of each artifact. 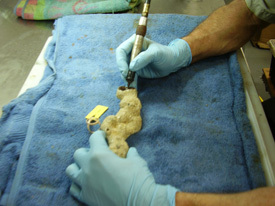 The first step in the physical conservation process is to slowly remove the concretion using an air scribe. This tool vibrates rapidly and slowly chips away at the layers of encrustation. See the pictures below to get a better idea of what this tool looks like. 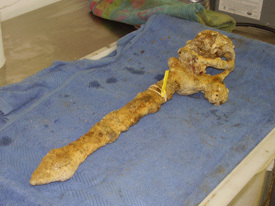 Once the majority of this thick portion is removed the artifact inside is placed into the electrolysis tanks where it sits in a mixture of soda ash and water. A stainless steel wire is attached to the artifact and a small electrical current runs through it. The combination of the soda ash, water and electrical current removes the salt particles from the metal itself. This is imperative because if they are not completely removed and the artifact is exposed to air it will dry out and crumble. The artifacts are in the electrolysis tanks for varying amounts of time depending on the type of metal, its salt content as well as the size of the artifact. Common items like spikes will spend 3 - 4 months in the tanks. 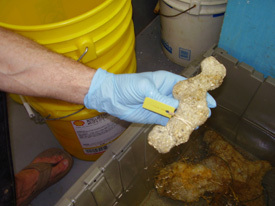 When they are taken out they are placed in a fresh water container and a few days later the salt content of the water is checked to see if any has leaked out of the artifact into the water. If there is still salt found to be in the water then the artifact is put back into the electrolysis tank. If there is no salt found to be in the water then the artifact is ready for the finals step which includes a light bead blasting, proper drying to remove any left over moisture and applying 3 layers of protective paint to avoid any further deterioration and also to give it the same finish it had when it was first made. After this is complete the artifact is considered to be fully conserved and will be able to stand the test of time in the open air above sea. John using the air scribe to conserve this sword. 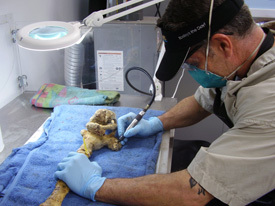 Up close look at the air scribe and the artifact. 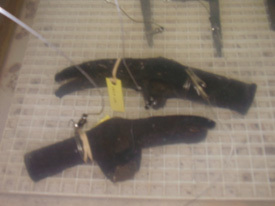 Two claw hammers after the encrustation has been removed and now in the electrolysis tank. 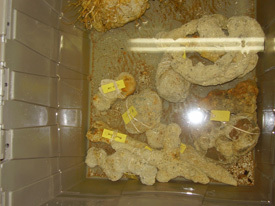 Encrusted objects being kept in wet storage awaiting conservation. Encrusted object which through experience believe to be two keys end-to-end. The dark area at the top shows where John is making progress in getting to the actual artifact.